Blazon: On a demi-Terrestrial Globe Azure & dark blue a Lion rampant guardant Gules holding in the forepaws a Bomb Sable. Link: The dark demi-globe is indicative of the night bombing role of the unit. The other components also allude to this role. 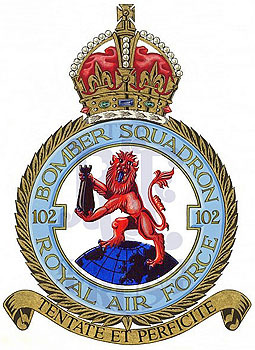 History: Formed at Hingham 9 August 1917 disbanded at Full Sutton on 27 April 1963.